Q.I have joined Planet Ink Club, what happens now? A.You will shortly receive in the post confirmation of your Planet Ink Club membership, along with some Planet Ink Club freepost recycle bags. Q.How do I get my empty cartridges recycled? Click on Order Cartridge Refills. Tick which type of cartridges you will be returning and select the quantities. Proceed and confirm the order. You will be presented on screen with your order number. Please write your order number in the space provided on the rear of the recycle bag. Q.How long will it take for my recycled cartridges to arrive? 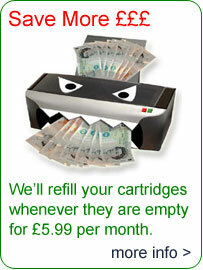 A.Our aim is to supply recycled cartridges, within 7 days of receipt of used cartridges. Q.I don't want to be without ink while I am waiting for my recycled cartridges to arrive, what can I do? A.There is a great way to ensure you never run out of ink - buy a spare set of ink cartridges from Planet Ink Club at a special members only discounted price. That way you can keep a spare set next to your printer and when your current cartridges run out, put your spare set into your printer and send the empties to Planet Ink Club for recycling. Buy a spare set of cartridges by going to the members special offer page or calling 0870 122 4306. Q.I have had a bad experience in the past with refills? A.Well, now you can have a good experience. At Planet Ink Club, we only use the finest quality inks, meaning you can print important documents and photo's knowing the quality will be there. All of our recycled cartridges come with a 100% quality guarantee, so you really have nothing to lose. Give the service a try and we're sure you'll be really happy with the quality of print from our cartridges. Q.What is the minimum term of my membership with Planet Ink Club? A.Your Planet Ink Club membership has a 3 month minimum term, after which you are free to cancel whenever you like by giving a months notice. Q.How do I cancel my Planet Ink Club membership?